French fries have become the stuff of legend. Not only are they a mainstay in the American diet, this delectable, deep-fried finger food has a long, international and sometimes controversial history. 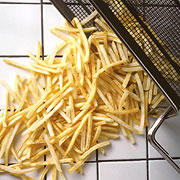 David Graulich is a French fry expert and is the author of The French Fry Companion: All About the Foods We Love to Eat. He traces the history of the French fry, tells us how it became such a large part of our culture, the quest for the perfect frozen fry and some of his own recipes.